The HP Spectre x360 has been -by far- the best mobility computer from MWC 2015. It is a good example of the new generation of Ultrabooks that have been putting the MacBook Air from Apple on the ropes, who were the market leaders in the ultraportable market until recently. Therefore, if Apple thinks someday to create a convertible they can now have where to draw inspiration from, because the HP Spectre x360 beats the Air in any comparison, from design, finish, to versatility and performance. HP, a classic hardware brand for Windows, has decided to embark on the Chromebook adventure with a series of laptops that stand out for their interesting combination of design, correct technical specifications and a great price. We have had the opportunity to test the new HP Chromebook 14 for a few weeks and these are our impressions. Despite its price, the new HP Chromebook 14 does not give you any feelings of a "cheap computer". It was built with good quality plastics and a remarkable level of assembly, this is a portable and robust notebook, thanks to its 14-inch screen, and it allows you to work without missing a monitor. The panel, a TN type, offers a native resolution of 1920 x 1080 pixels and a more accurate quality for the niche it targets and considering also the price range in which it operates. Even though numerous experts have been predicting the abandon of desktop computers since several years ago, it’s still the sector of computing market in which you can obtain the maximum CPU power and without a doubt the best performance/price ratio of hardware and devices. Despite releasing numerous portable devices, All-in-ones and tablets, HP has not forgotten about one of the markets with their largest presence and has released the new HP Envy Phoenix 800 and Envy 700, two desktop computers oriented to offer a superior performance to the alternatives for the office. The Envy Phoenix 800 comes with a black case with red LEDs, we know it’ll feature a 4th generation Haswell Intel Processor and Nvidia graphics card, though the exact model of the latter is still unknown, which makes us think it will be a model of the new GTX 700 series. The basic model will be around 1100 USD, and it will hit the market on June 5th. 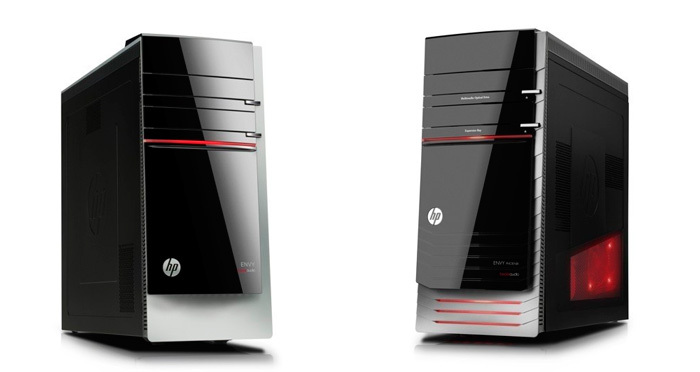 For its part, The Envy 700 (to the left in the picture) will allow the user to choose between different AMD or Nvidia graphics cards. Its CPU will also be an Intel Core Haswell. It will be released on June 5th as well, but its price will be considerably lower (around 600 USD), so the most basic model will likely feature more modest components.